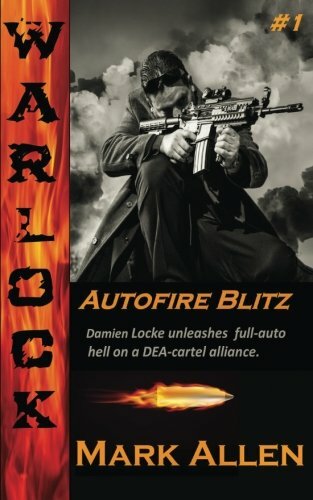 With that kind of testosterone, Mark Allen's debut 'Warlock' novel, “Autofire Blitz”, is the perfect companion piece to 80s action movies and books. In what he considers an ode to the pop culture that inspired him, Allen created Damien “Warlock” Locke, a bullet spewing vigilante with purpose. The book begins with a swift flashback to January 17th, 2011. Locke finds himself an amnesiac left for dead in Afghanistan. With no prior knowledge of his life, or who put the bullet crease in his head, Locke is left with a clean slate on life. He has tattooed names of “Damian Locke” and “Warlock” on his arm...so Locke and Allen are running with that. Experience fighting bad guys? Yeah, Locke has it in spades. He can only guess that he's had explicit training with the Navy Seals or Delta Force, and from the action sequences here...I'd say that skill-set and more. Fast forward to present day and Locke's current mission – rescue a 10-year old boy from the clutches of a drug cartel. The only problem is that this particular cartel has deep, corrupt ties to the DEA. As Locke hits various pool halls, bars and alleys, the story starts to expand and “flesh” out – meaning long, descriptive explanations of bullets penetrating organs (like when horror authors dish out pink-gray froth for their intended victims). That's really what sets Allen apart from the 80s and early 90s vigilantes. This author is way over-the-top in terms of rapid fire delivery and graphic violence. I can't help but compare it to horror novelists like Edward Lee or Jack Ketchum (and Allen himself dabbles in the horror genre as well). It's expressive...to say the least. Whether you like or dislike that sort of thing is the measuring stick on your entertainment value here. For me personally, I can run with over-the-top if it is fun, senseless and has some boundaries. “Autofire Blitz” is a fun, compelling and gritty read from an author who is clearly a fan of the action and adventure genre. While Paperback Warrior typically doesn't read or review contemporary (maybe TWO A YEAR), this was an entertaining novella that fueled my desire to check out more of Allen's work. You can find him and his books on his Amazon page.